Luxembourg offers an excellent infrastructure and the optimal environment for companies aiming to ride the digital wave and successfully implement Industry 4.0 to retain a competitive edge on the world market. 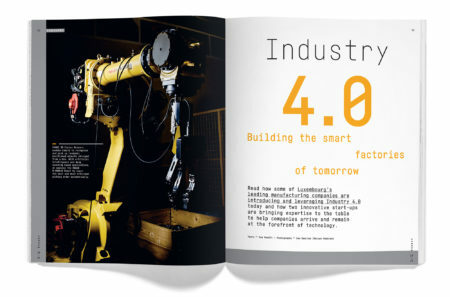 The state of the art and government ambitions as well as case studies of Luxembourg-based companies at the forefront of this development are presented in a 17-page special feature on Industry 4.0. The magazine also covers the latest developments of the space, ecoinnovation and ICT sectors. “Our objective is to reveal the technological know-how that exists within Luxembourg’s ecosystem, the opportunities it offers for innovation, and thus spark the interest of international technology and business leaders and innovators,” Luxinnovation’s CEO Sasha Baillie explains. Happen is published by Luxinnovation in collaboration with Maison Moderne and distributed to an international audience. Although the first edition was only published in 2017, the magazine has already received an Award of Excellence in the category “Corporate media – typography, layout” at the International Creative Media Awards 2018.